Save on all photographic prints, July 5 – July 7! Sale includes all print sizes starting at mini-wallets up to 30×40 prints, including custom sizes. The automatic discount will apply to Ambassador and Thrift E-Surface, True Black & White, and Metallic prints when ordered through Remote Suite PLUS Print Products and ROES. Finishing services are not included in the discount. Sale ends at midnight (Central Time) on Thursday, July 7, 2011! The sale price is not reflected in my order summary. Am I really receiving a discount? Yes, you are receiving the discount; however, the sale price will not be reflected in order summaries or email confirmations. The discount will only appear after the order is transmitted and received by the lab. Do I need a coupon code? No, the discount is automatically applied to orders once they enter our system. My order total is less than the $10 minimum charge? What amount will be invoiced? Minimum order charge will remain throughout the duration of the sale. Any order total that falls under the minimum charge will be rounded up to $10. 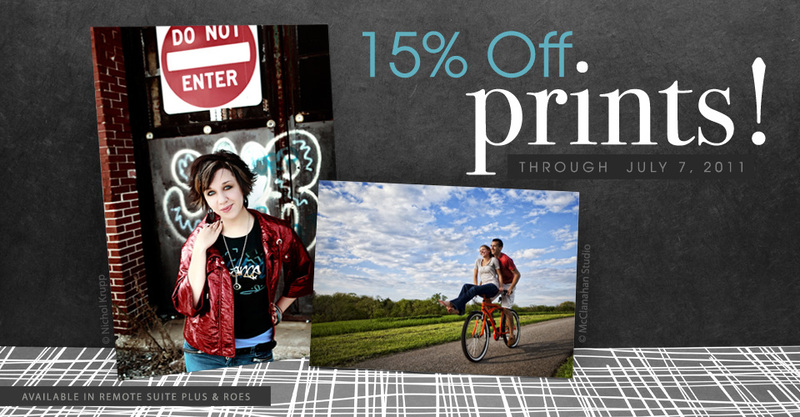 Will I receive 15% off when ordering multiple prints from one image? The discount will apply to all prints, regardless of number of prints per image or number of prints per order. I uploaded a print order just prior to the start of the sale. Can I receive a credit? Unfortunately, any print ordered prior to the start of the sale will not be credited. If I order prints via Proofing, Sports & Events, School, or LabPrints, will I still receive the discount? No, orders will only be discounted when placed through ROES and Remote Suite PLUS Print Products. Any order placed through any other software will not be discounted.